Vicolo Inferno: somebody's been to the gym. The band takes their musical cues from basic hard rock, classic and post-grunge, easily crossing over into heavy metal. They're still melodic but definitely trying to push a heavier riffs against everything else. Excepting a few songs, in a lesser or greater degree, this basically describes Vicolo Inferno as a certain homogenous predictability about their tunes. The exceptions come with the very fine Tombstone with it's southern, even western, motif thanks to crafty lap-steel or slide guitar work. Another highlight is Dangerous Dreams which has a more catchy rock groove than most other songs here. In Your Red, another, finds VI toning things down, slightly, for a passionate ballad. The real gem is the bonus track Lipstick, where VI returns to the accessibility of basic melodic hard rock, putting aside the heavy riffage and upping the ante with better melody, vocals, and a truly catchy refrain. It's radio single material. If they follow some of this formula the next time around, they might break away from the herd. 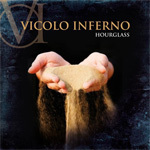 Vicolo Inferno's Hourglass is a blend of hard rock and metal in a modern context but, with a few good exceptions, often homogenous and predictable.